With a few notable exceptions, the United States Presidency is attained by a constitutionally mandated electoral process. He was not the first person to hold the office without having been elected to it, however. The first person to constitutionally occupy the Oval Office without a single vote ever having been cast for him was Gerald R. Ford (born Leslie Lynch King). He was appointed to the job of Vice President by Nixon after Spiro Agnew’s resignation from the Number Two spot; when Nixon resigned as President, Ford assumed the Presidency. The Electoral College has been notoriously cantankerous in the 200-plus years since it was formed. By design, electors are committed to casting their votes for the candidate to whom Credit: Vic Dillingerâ„¢, Â© 2011 they are pledged. This hasn’t always happened; in a few instances, electors have given their votes to others. James Monroe’s election was marred by one elector who simply refused to cast his vote for Monroe; the reason was so that George Washington would remain the only person elected by unanimous decision (Monroe missed that unanimity by that one vote). There is one person whose Presidency, having nothing to do with electoral college shenanigans, was unnoticed by history until well after the fact, though. The only person ever to technically occupy the office, and execute all of its duties without the benefit of the electoral process, also happened to be America’s first female President, Edith Bolling Galt Wilson, the second wife of Woodrow Wilson, the 28th President of the United States. The future Mrs. President was born in Wytheville, Virginia, on October 15, 1872. As far as American pedigrees go, Edith Bolling’s was one of the more impressive. Her father was a circuit court judge, and it is through his family line Edith was related by blood to Pocahontas (the Native American girl of Colonial history), through a granddaughter of Pocahontas’, Jane Rolfe Bolling. She was also a direct descendant of the Planganets, one of the first families to settle Virginia. And as a further connection to the corridors of power, her paternal great-grandmother, Catherine Payne Bolling, was the daughter of Martha Dandridge Payne (whose father Nathaniel West Dandridge was a first cousin of Martha Dandridge Custis, wife of George Washington). Edith was the seventh child in a household that would ultimately produce eleven offspring. Despite the “royal” blood, the Bolling family was down on their heels. The family’s lands had Credit: public domain been lost thanks to the Civil War, and although they were rebounding financially, they had yet to assume their former place among Virginia aristocracy. Edith did not want for much, regardless of the family’s social standing at the time of her birth. Wytheville is in the extreme western section of Virginia, and at the age of twelve, she left home for the first time when she accompanied her father on a trip to Richmond, many miles to the east. When she was fifteen she enrolled in Martha Washington College in Abingdon, Virginia (two counties west of Wytheville). There she studied music. She then transferred to another, smaller, private school in Richmond for her second year of secondary education. Considering the family’s financial state it wasn’t long before Edith had to stop her private education. She returned to the homestead; her education was rounded out by her grandmother who home-schooled the girl in the basics. Edith Bolling grew into a curvaceous and beautiful young woman. She adopted the Gibson Girl look of her day, and she perhaps was a living embodiment of that fashion icon, with the expansive bust line and wasp waist. One of Edith’s married sisters lived in Washington, DC, and Edith went for an extended visit. While there in 1892 she met a man named Norman Galt. He was a jeweler, and he was prospering. He and Edith hit it off. She was in no hurry, however. She made him wait – they weren’t married until four years later in 1896. In 1903, the 31-year-old Edith gave birth for the first time. The baby, a boy, died a few days after his difficult delivery. She was left unable to carry a baby to term after this. In 1908, her husband died suddenly. At 36 and a widow, with not much else to do, she hired a manager to run the Galt jewelry store, and her success in the business world was secured. In a completely different world of scholarly pursuit versus Edith’s realm of social gallivanting, Thomas Woodrow Wilson (born 1856 in Virginia) grew up and became first a lawyer, then a college professor, and finally president of Princeton University. He entered politics in 1910, giving up the realm of academia, doing a hitch as governor of New Jersey. From 1911 on, Wilson made it clear he wanted to run the country, and he assumed the Highest Office in the Land on March 4, 1913, burying (with 435 electoral votes) Theodore Roosevelt (who drew 88 electoral votes) and William H. Taft (with 8). To date, Woodrow Wilson is our most educated President with over a dozen degrees and several self-penned books under his belt before taking office. He was perhaps also the most prescient of Presidents, laying the groundwork for the United Nations (seeing ahead to the time when the world would become more internationally connected, an idea in conflict with his own isolationist policies regarding the US). He also aggressively fought against legislative changes that would end segregation to the supreme disappointment of black leaders of the time such as Booker T. Washington who had made many appeals for reform. His position with Native Americans and their concerns was equally onerous – he thought of himself anachronistically as a Benevolent White Father to them. Woodrow Wilson was married when he took office to Ellen Louise Axson (married June 24, 1885). She and Wilson had three daughters during their marriage [Margaret Woodrow Wilson (1886–1944); Jessie Wilson (1887–1933); and Eleanor R. Wilson (1889–1967)]. Barely a year after taking the Presidential oath, Woodrow lost Ellen on August 1914 when she died. He was devastated, and mourned her passing deeply. The socialite widow-about-town Edith met the mourning President Wilson via an introduction by a female friend of hers who was dating Wilson’s personal physician. The doctor knew of Edith certainly, and he asked his girlfriend to set up an “accidental” meeting between Edith and Woodrow. Wilson’s acting hostess for White House functions at the time was a cousin of his named Helen Bones. The doctor felt Wilson’s loneliness was wearing on him, and in March 1915, Helen Bones, the doctor, and Edith’s friend managed the “accidental” meeting between Edith Bolling and Woodrow Wilson. Wilson was immediately smitten as well he should have been. The 43-year-old Edith was fifteen years his junior. She was charming, bright, gracious, and very physically attractive. Unfortunately, she also shared his racist views of African-Americans, and she loved “darky” jokes. Wilson pressed his case, however, and Edith relented. They got married in her spacious manor on December 18, 1915, in a private ceremony. They then went off and honeymooned for two weeks, first in Warm Springs and Hot Springs, Virginia, a resort area in the Allegheny Mountains of northwestern Virginia (coincidentally one county west of Wilson’s birthplace), then across the border in White Sulphur Springs, West Virginia. Edith’s installation as First Lady should have been unremarkable; it only meant there was now a female presence in the White House. However, Edith’s personality combined with Wilson’s Credit: Library of Congress, public domain genuinely treating her as a peer changed that dynamic. In a perfect parallel between James Madison and Dolley Madison (where Dolley influenced and worked with her husband on affairs of state), Wilson took Edith with him to almost every meeting, or summit abroad, and he valued her advice and counsel. She quickly became attuned to the politics of Washington, and she was as much a part of Wilson’s decision making as his cabinet members were. Wilson was handily re-elected in 1916. With respect to World War I (in its third year by this time) he had originally taken the stand that the fight was in Europe by Europeans over European concerns, none of which involved the US. A communiqué between Germany and Mexico was intercepted, however, that changed his mind. This message related that Germany would help Mexico regain Texas and other territories lost to the United States if Mexico would fight. German submarines then sank three US merchant ships in March 1917; the US reluctantly entered World War I after Wilson finally realized it could no longer be avoided. As First Lady during World War I, Edith perhaps took rationing to an extreme. She instituted a program of “gasless” Sundays, “meatless” Mondays, and “wheatless” Wednesdays to set an example for the Federal rationing effort. She also turned sheep out to graze the White House lawn instead of paying to have it mown and wasting gasoline on such a trifling thing. She auctioned off the sheep’s “White House Wool”, and the proceeds of the sale went to help the American Red Cross. When the war was winding down, Edith accompanied Wilson to Europe when the victorious Allies met at Versailles to discuss peace terms. At this time there was no Constitutional amendment limiting a president’s terms (Franklin Delano Roosevelt was elected to a record four terms, dying in office shortly after his fourth inauguration). Wilson fully intended to run for President again as the election of 1920 approached. However, he had an agenda to push first. Wilson went to the peace treaty summit at Versailles with what he called his “Fourteen Points” for peace. Among these was a call for establishing an international tribunal to work out issues between countries before they escalated to the level of what had just passed. He called this concept the League of Nations. He believed in it so much that he was forced to concede most of his peace initiatives in favor of keeping that idea alive. The American public and Congress were livid with the concessions made by Wilson in Versailles. As a result, the backlash against the League of Nations concept was almost instantaneous. Wilson, after returning home from Versailles in June 1919, spent the next few months on the road, traveling over 8000 miles promoting his idea to the public. He was not calling for a unified world government, just a panel of representatives who could hear and rule on international affairs. Wilson suffered from hyper-tension most of his adult life, and his health was dodgy at this time from all the traveling and stress. After speaking in Pueblo, Colorado, on September 25, 1919, he collapsed from what Edith believed was exhaustion. They returned to Washington, but on October 2, Wilson had a stroke. It left him partially paralyzed, with slurred speech and unable to move the left side of his body. The country was effectively without a President, and though the Constitution provided for succession if the President left office via death, resignation, or impeachment, it had no provisions to cover who should be in charge if the president were incapacitated and unable to fulfill his duties competently. Wilson recovered nominally, just enough to pretend to be healthy. His plans for campaigning moved forward, but he knew he could not effectively gain the Democratic nomination in his current state. Keeping the news from the public (and none of this was divulged until several years after Wilson’s death) Edith Wilson took over as the unelected President of the United States for the rest of Wilson’s term. Ironically, women could not yet vote in America. The Democrats selected a stooge in Wilson’s stead to run for President; it came as no shock when Warren G. Harding, the Republican candidate, swept the polls. Wilson was bitterly disappointed. He did not have the strength to fight for the League of Nations in Congress, and since no one knew just how bad his condition was he could not send Edith in his stead. Knowledge of his incapacity would have paralyzed the country. Edith simply ran about the business of being President. She did it quietly and with full knowledge of the White House and its staff. She attended meetings, sat with the Cabinet to discuss current matters, and acted on Wilson’s behalf with the full color of the authority of The Office behind her. No one knew in the private sector what was going on. It was business as usual. Wilson’s glimmer of hope for an international forum was partly validated when, in December 1920, he was awarded the Nobel Peace Prize for his League of Nations ideas. The germ of his work later formed the foundation for the United Nations. One piece of legislation that Edith Wilson no doubt had a strong, feminine hand in helping along was the Nineteenth Amendment. This was ratified in 1920, during the time of Wilson’s debility, and it would have probably been Edith who coaxed it along. This amendment gave women the right to vote. At the change of administrations in early 1921, the Wilsons retreated to a quiet home in Washington. Woodrow Wilson never fully recovered, though he put on a brave face. After malingering, he Credit: public domain died in their home on February 3, 1924. Edith was still a popular fixture about Washington, and she remained that way for the rest of her life. She even rode in President Kennedy’s inaugural parade in 1961. On December 28, 1961, she died of congestive heart failure, age 89. The day held two other significances – it was Woodrow Wilson’s birthday, and it was also the same day a new bridge, opened for traffic and named for Wilson, was dedicated in Washington, DC. Edith was scheduled to appear at the opening ceremony that day. Most people know nothing of her, yet Edith Bolling Galt Wilson is one of American history’s most remarkable, and undeservedly overlooked, women. One can only imagine having the weight of the country thrust upon one’s shoulders involuntarily. Yet, she rose to the challenge; at the time she took over the country’s reins, women did not even have the right to vote. 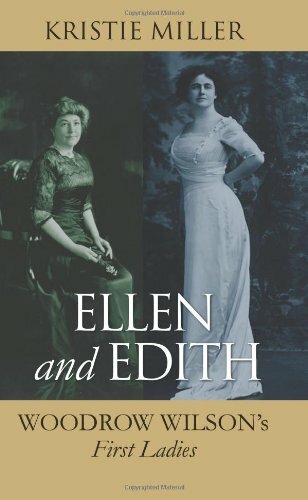 When the Wilsons retired from the White House to make way for the incoming Harding Administration in 1921, Edith had run the country for over a year – America never knew the difference. What a woman she must have been -- and I thought Eleanor Roosevelt was something! I've been mad at Eleanor Roosevelt for years (despite all her crusading, she failed her own kind by undermining the earliest version of the ERA). And Edith was wayyyy hotter than Eleanor (always a big factor in my book). Really, though, I don't get how they managed to keep a lid on it for so long. Thanks for reading. The electoral college members who fail to vote for the candidate they were pledged to are called "faithless electors". Cool tidbit. Very interesting article about a very interesting woman. I have another name for them... There have been far greater electoral abuses than what Monroe got, but that's not was this piece was about (I just wanted to lay down some expository material) Thanks for checking out Edith. Love this. Your "detective" work on this article is great. Thumbs up for a well researched and well written work on the first female American president. Yes!!! Edith really is deserving of some recogniton -- I can't think of too many First Ladies in that era who would have had the chutzpah to go ahead and step in. Thanks for reading. Your articles are always well interesting and new information. Where do you find out about these things? I love the stories mixed in with the info! great job! I lie a lot and make stuff up. Seriously, I have a nearly photographic memory (which is both a blessing and a curse) so some little tidbit will stick in my brain for retrieval later. Edith Wilson figured as one of my areas of research when I was working on an article about the failure of the Equal Rights Amendment. I knew she had helped ol' Woody out after his stroke, I just didn't know how deep her "help" went (she really WAS the Prez). Edith Wilson was a truly great First Lady. Thanks for reading. David C. Whitney The American Presidents. Garden City, NY: Doubleday, 1985. "Woodrow Wilson." American Peoples Encyclopedia. 1963.